Have you ever noticed how salespeople just seem to connect to each other regardless of age, industry or even nationality? I experienced this first hand on a vacation in Florida a few weeks ago where I had the pleasure of meeting a gracious American retired sales professional named Jim Mandy. Jim was kind enough to share some of his best sales strategies from over the years and I’d like to share one of them with you. Jim and I both agreed that far too much emphasis is placed on closing in sales training and in conversation among salespeople. As a trainer, I often get asked by sales leaders to come in and “help my people close.” Unfortunately, after doing some investigation, the real problem usually makes itself clear. The sales reps can’t close because they’ve done a poor job of all the steps leading up to the close. Some people still believe that using outdated and unprofessional verbal trickery at the end of a poorly executed selling process will somehow persuade a customer to buy even when the salesperson has done very little to demonstrate a need or provide an effective solution. If you’ve properly completed the steps in the consultative selling system, closing will be easy and quick. If not, it will be hard and slow. The key to closing starts way back at the beginning of the selling process by doing a great job of uncovering issues, challenges, goals and preferences. This is best done by using carefully written, preplanned questions in what Jim calls the “survey” phase. This is sometimes also called the “discovery” phase in other sales models. 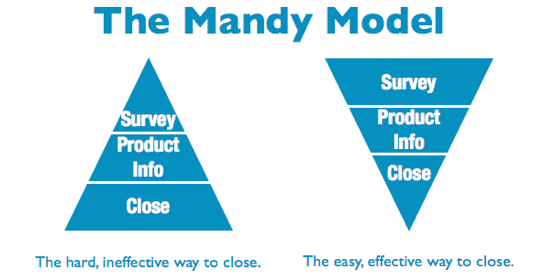 The next step to make closing easy is to demonstrate to the customer how your solution fits with their unique problems. Optimally, you should provide unshakeable evidence that you can deliver on what you claim through case studies, testimonials or key performance metrics. This phase is called “product info” in Jim’s model. For everything but very small sales, I recommend the above steps are done in separate meetings with the customer. Only after you’re finished with these steps have you earned the right to close. If done properly, the close (also known as “asking for the order”) should be a nonevent and could be as simple as saying something like, “Would you like to go ahead with blank?” If the customer has agreed throughout the selling process that they need their problem fixed and has confidence that you’re the one to fix it, why would you need to do anything “tricky” to close? In our meeting, Jim illustrated this idea by pulling out a 3 x 5 recipe card with a carefully hand drawn diagram which I have tried to replicate here. 1) Go into your next sales call with a set of preplanned questions that will help you uncover your customer’s true issues and their impact. 2) At your next meeting, confirm with the customer that you have captured the issues accurately. 3) Carefully and systematically demonstrate how you can solve these issues better than anyone. After describing each feature and their related function and benefit, get confirmation from the customer that he agrees that it will address the aforementioned issues. 3) Close. Ask for the order in a direct and confident manner! I could have shared sales stories with Jim all day. We were like two fishermen bragging about our biggest catch and giving advice on our best lures. My last piece of advice is the next time you meet a friendly retired sales professional like Jim, take some time to listen carefully. You never know what you might learn. As the adage goes, there’s no substitute for experience!